Swimming with your baby can seem overwhelming, or even scary. But with these Steve Wallen Swim School swimming tips you can get your baby water safe and swimming laps in no time! Whether you do it at Steve Wallen Swim School in El Dorado Hills or Roseville, your pool at home, or even the bathtub, the earlier you get your baby started, the better! This is probably the easiest thing you can do for your baby to get them pool ready. Don’t avoid getting your baby’s head and face wet – make it the most fun part of pool or bath time! Use a cup or even just your hands to gently scoop water onto your baby’s head. Gradually pour water onto their cheeks, chin, forehead, and ears – though be careful there’s no soap in the water. For your older babies who can hold their own heads up, have them practice getting their whole face wet by looking into the bathtub or pool water. Make a game out of it! Look for toys, or “magic fish” you can only see if you put your eyes in the water — just like at Steve Wallen Swim School in El Dorado Hills and Roseville! This is something you can do during tummy time, or even while lying on the couch – water is optional! For babies, any kicks are good kicks, but as they start to get older, try to teach them “straight leg kicks.” Instead of bending our knees and kicking with the bottom half of our legs, we want to kick with our whole leg. Grab their feet when helping them kick instead of grabbing their knees, so they can feel their whole leg moving. Repeating words such as “kick kick kick” or “one two one two” helps our babies associate those words with the action of kicking. Pick a phrase and repeat it every time you practice kicking, so that soon enough your baby with associate those words with the action, and when you say them, they’ll kick on their own! Practice holding onto the edge of the pool with your babies, so they know that the wall means safety! Do safety “humpty dumpty” jumps on the edge of the pool, by holding onto your baby, singing the song, and gently pulling them into the water. Then, help them get back to the edge and practice grabbing onto the wall again! Your baby is never too young to start practicing water safety! Come on in to our pool during parent-tot swim lessons in El Dorado Hills or Roseville and practice these skills with your baby and the help of a trained Steve Wallen Swim School swim instructor! Meet other babies, and get your babies water safe! 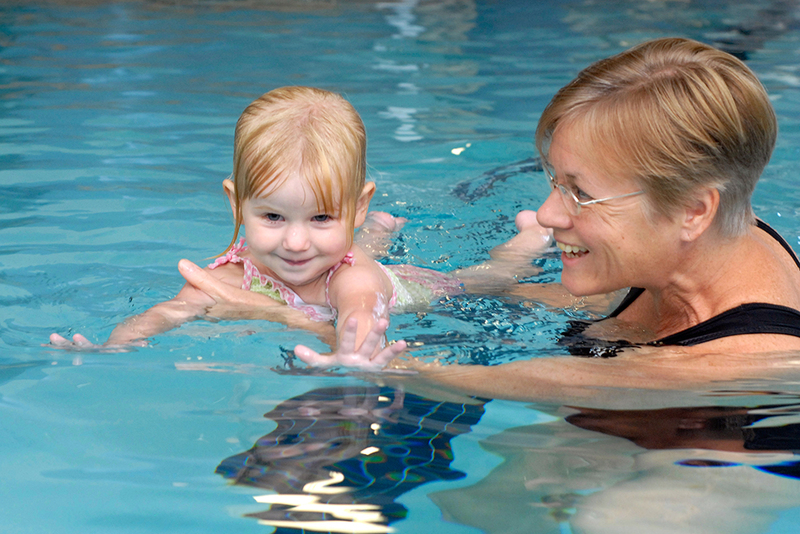 For more information on parent-tot swim lessons, call us or visit our website! This entry was posted in El Dorado Hills, Folsom, Roseville. Bookmark the permalink.